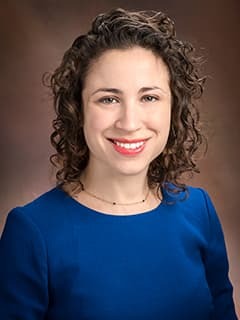 Alexandra Perloe, PhD, is a pediatric psychologist in the Eating Disorders Program and the Department of Child and Adolescent Psychiatry and Behavioral Sciences at Children's Hospital of Philadelphia. Perloe, A., & Pollard, J. W. (2016). University Counseling Centers’ Role in Campus Threat Assessment and Management. Journal of Threat Assessment and Management 3, 1-20. Perloe, A., Esposito-Smythers, C., Curby, T. W., & Renshaw, K. D. (2014). Concurrent Trajectories of Change in Adolescent and Maternal Depressive Symptoms in the TORDIA Study. Journal of Youth and Adolescence, 43, 612-628. Weiner C., Perloe A., Pincus D., & Whitton S. (2012). Attentional Bias in Adolescents with Panic Disorder: Changes over an 8-day Intensive Treatment Program. Behavioural and Cognitive Psychotherapy, 40, 193-204. Becker, A.E., Arrindell, A.H. Perloe, A., Fay, K., & Striegel-Moore, R.H. (2010). A Qualitative Study of Perceived Social Barriers to Care for Eating Disorders: Perspectives from Ethnically Diverse Health Care Consumers. International Journal of Eating Disorders, 43, 633-647. Becker, A.E., Eddy, K.T., & Perloe, A. (2009). Considerations for Clarifying Phrasing for AN Criteria A and DSM Text Guiding Clinical Interpretation of Cognitive Signs and Symptoms in AN and BN. International Journal of Eating Disorders, 42, 611-619. Esposito-Smythers, C., Perloe, A., Machell, K., & Rallis, B. (2015). Suicidal and Non-Suicidal Self-Harm Behaviors and Substance Use Disorders. In Kaminer, Y., Ed., Youth Substance Use Disorders and Co-Occurring Disorders (Ch. 10). Arlington, VA: American Psychiatric Publishers. Perloe, A., Hernandez-Cervantes, Q., Esposito-Smythers, C., & Spirito, A. (2014). Adolescence: Prevention and intervention efforts. In van Dulmen, M. H. M., Bossarte, R. M., & Swahn, M. H. Eds., Developmental and public health perspectives on suicide prevention: an integrated approach (pp. 37-57). New York: SciKnow Publications. Becker, A.E., Perloe, A., Nyquist, L., & Kaplan, L.M (2008). Complementary and Alternative Therapy for Weight Management. In D. Mischoulon & J. F. Rosenbaum (Eds. ), Natural Medications for Psychiatric Disorders: Considering the Alternatives (pp. 245-280). Baltimore, MD: Lippincott Williams & Wilkins. Perloe A. “Non-suicidal self-injury in adolescents.” Presentation given at Children’s National Medical Center, Department of Adolescent Medicine, Washington, D.C., March 2015.